Broward County is one of Florida’s most heavily urbanized areas. Yet it was probably one of the most botanically diverse, with more than a dozen different native plant communities, as shown on this close-up view of the Plant Communities map. The light blue swath is the Everglades. The best example of native coastal landscaping can be found in Hugh Taylor Birch State Park. In Fern Forest, Broward County Parks, a remnant wetland forest can be seen – just a fraction of what was once one of the richest ecosystems in Southeast Florida: a river running through huge Bald Cypress trees and a forest of tropical trees covered in orchids, bromeliads and ferns. Throughout this website, you’ll see references to the “plant communities map” and on county pages, you’ll see local segments of it. 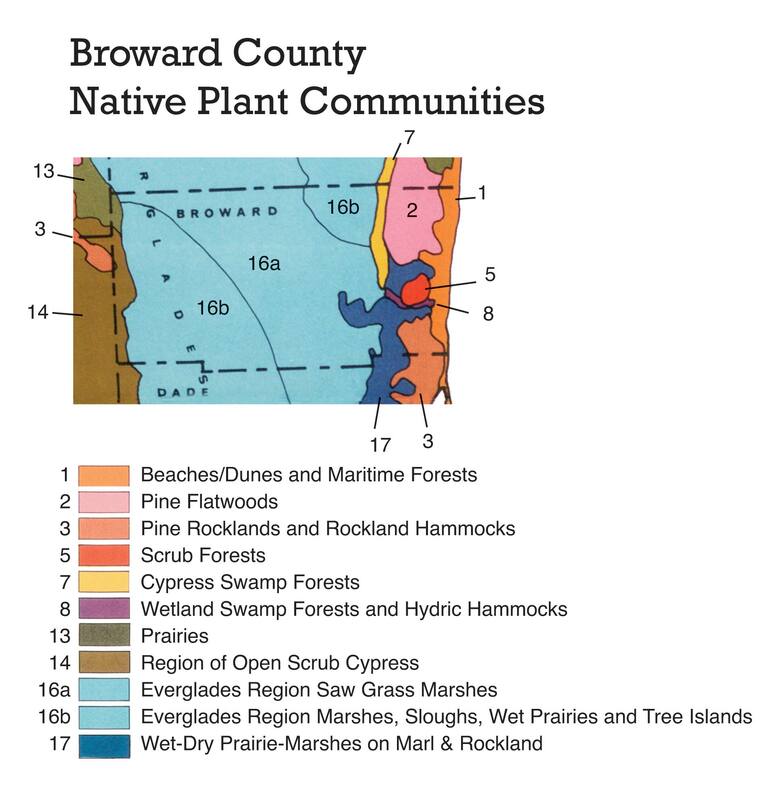 The map is used to illustrate the natural diversity of Florida and to show where in the state certain native plant communities occur. It is necessarily a “broad brush” treatment, and cannot reflect the detailed reality of any particular place on the ground. But by looking at the map, you can see the most common native plant communities in any county – or at least what they were before the mass urbanization of the last 50 years. The plant communities map is a starting place for understanding authentic landscapes and how natural models can serve to inform sustainable Florida landscape design. FANN has used the map to develop a practical framework for selecting native landscape plants based on Florida’s native plant communities. This framework is integrated with plant availability on this website, and is also available in reference book form: Xeric Landscaping with Florida Native Plants, originally published in 1991 and recently re-released. FANN’s framework can be used to identify native plants which can work well on chosen landscape sites. In addition to plant fitness, planting in “communities” gives a landscape a visual cohesiveness and authenticity that cannot be obtained any other way. Of course, when selecting native plants, there are other important factors that can “make or break” your project: sizes and availability, ecotypes and genetic diversity, adaptability and landscape performance, seasonality and use, establishment and maintenance. Talk to growers, who are eager to help you select the best plants for your place. FloridaNativeNurseries.org can help you locate plants found in historical plant communities and put some “Real Florida” in your commercial, institutional and residential landscapes. It is possible to create and restore native ecosystem functions in urban and suburban landscapes, and this noble goal is needed now more than ever. Restoration and preservation of conservation areas can get complex in a hurry – because ecology is complex – and FANN encourages you to seek the assistance of our professional members, including environmental consulting associates, who can help your project be successful.